General tonic for mending bones, tendons and ligaments; soft tissue damage, aid the mending of broken bones and strengthen the surrounding joints, internal or external bruising or swelling, traumatic sprain, traumatic fracture, traumatic dislocation, inflamed ligaments are some of the imbalances satisfied clients have used this product for. Invigorates, tonifies and moves blood, breaks blood stasis, stops bleeding, strengthen bones, tendons and ligaments, dredge and open channels and collaterals, pain relief. Dipsacus asper root, Panax notoginseng root, Paeonia lactiflora root, Boswellia carterii resin, Commiphora myrrha resin, Carthamus tinctorius flower, Daemonorops draco resin, Sparganium stoloniferum rhizome, Paeonia lactiflora root, Caesalpinia sappan wood, Glycyrrhiza uralensis root, Angelica sinensis root, Eupolyphaga sinensis, Paeonia suffruticosa root-bark, Cucumis melo seed, Prunus persica seed, Saposhnikovia divaricata root, Akebia trifoliata stem, Drynaria fortunei rhizome, Citrus aurantium fruit-immature, Artemisia anomala herb, Platycodon grandiflorum root, Corydalis yanhusuo rhizome, Curcuma longa rhizome, Activated Carbon, Botanical wax, Talcum. - Xu duan, Tian san qi, Chi shao, Ru xiang, Mo yao, Hong hua, Xue jie, San leng, Bai shao, Su mu, Gan cao, Dang gui, Tu bie chong, Mu dan pi, Tian gua zi, Tao ren, Fang feng, Mu tong, Gu sui bu, Zhi shi, Liu ji nu, Jie geng, Yan hu suo, Jiang huang, Activated Carbon, Botanical wax, Talcum. 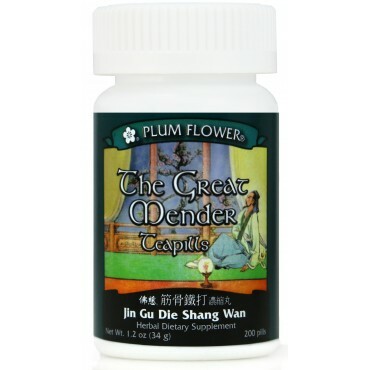 The Great Mender Teapills - Jin Gu Die Shang Wan is contraindicated during pregnancy.